"A progressive-metal band presenting epic tales orchestrated by mountains of rock guitars, luscious keyboards, huge drums & bass, and soaring vocals which remind you what great rock music is... and always will be." 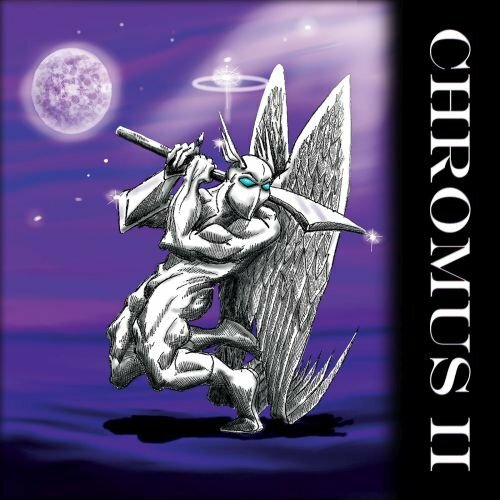 Scott Karnas (vocals), Max Davis (guitars), Mike Peterson (drums), Don Bird (bass & keyboards), and Phil Davis (keyboards & vocals) have all raised their craft to an even higher dramatic level with their second album "Chromus II". Crank up the volume and ride along with them as they lead you from the Gates of Hell to Jerusalem in their unique, hard-rock vision of a soldier returning from war. The cd includes 7 panels of full-color original art with illustrated lyric sheet, hand-drawn and colored by Chromus drummer Mike Peterson and assembled by Johnathan C. Davis. The physical cd including all color panels of art is now available on Amazon. 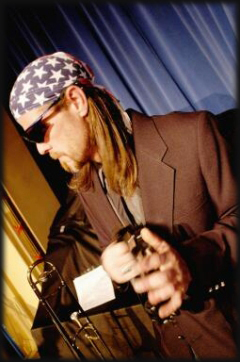 Enter Mike Peterson: Mike had performed on drums with Phil in several local musical offerings. But Mike's story really began with Aberdeen metal-heads JED. Many in the Aberdeen, WA music scene believe it was Mike's awesome drumming which facilitated JED's considerable success. 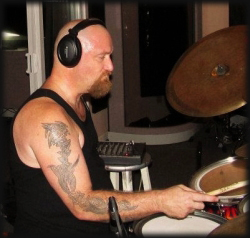 Mike has also played for the Seattle Seahawks drum line, and for nearly every Western Washington band who needed a talented drummer, be it studio or live. 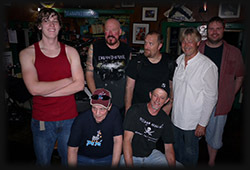 Mike is always in-demand and is a rock mainstay in the Pacific Northwest region. Mike loved the concept of CHROMUS from the get-go and perhaps more importantly, loved Karnas' vocal style as well. Which leads us to CHROMUS's 'other vocalist', Brian Cokeley. 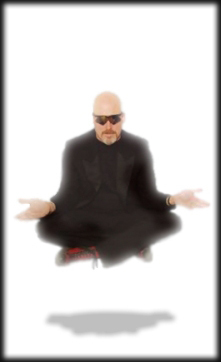 Brian has an impressive list of credentials which includes teaching at the LA Musicians Institute as a vocal instructor, performing & singing on 2 cd's with the progressive rock band Presto Ballet (Inside Out Music and ProgRock Records), and being a multi-instrumentalist wizard in his own right. 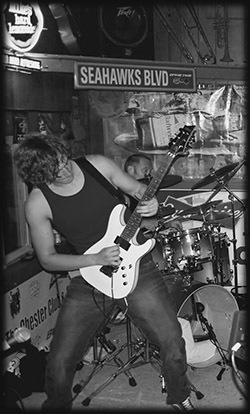 Brian plays many instruments including piano, guitar, bass, and drums. Great songwriter; wonderful player; outstanding singer... and that high voice! Next up is Max Davis: Max was truly the unexpected wild card in the CHROMUS deck. Only 18 years of age, Max brings his immense guitar sound and fascinating neo-classical prog-metal style to CHROMUS and definitely leaves his mark on the music. Having taken folk guitar lessons from the former mayor of South Bend, who could have imagined what he would grow into? Or what he would help CHROMUS grow into? "I'd have never believed we'd find this metal-meister sleeping just down the hall!" says Phil. "This was just way too cool!" Max's first songwriting effort ("Rain") is track #2 on CHROMUS... Check it out! 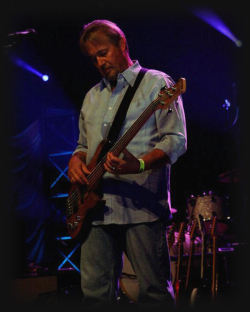 Which brings us to Don Bird: Don plays bass, keyboards, guitar, sings and is one of the primary songwriters for CHROMUS. Don has a cool history starting with a career as a trumpet player with a diverse track record including performances with the Bellevue Philharmonic Orchestra as well as jazz gigs including a stint with the New Deal Rhythm Band. A multi-talented musician and studio artist, Don recorded, engineered and produced numerous radio and television spots and orchestral scores for industrial film productions while also mastering sound synthesis, sampling and early sequencing technologies that led to a stint with the inventor of the first digital drum machine, Roger Linn, and work on one of the first guitar-to-MIDI converters. He went on to develop and market revolutionary broadcast digital audio and video players as well as digital cinema systems for mastering and distribution. 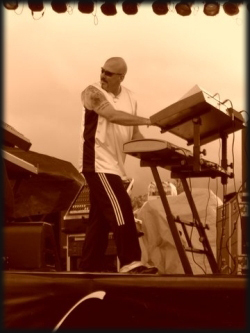 Don has performed in every musical style and idiom on bass, keyboards, synthesizers, horns and even some oddball invented sound sources, and has worked with several talented Seattle bands including Gabriel, Shots, and Ears, where he worked with Grammy Award Winning producer Paul Speer. He also recorded and produced an earlier album with Phil in a duo-project for A&M Records/Canada. Don has also worked extensively as FOH sound engineer, mixing for a number of reknowned acts including The Dave Crowder Band, Kendall Payne and Blyss (Lifehouse). Last, but certainly not least, is Gordo Lynn... In many respects, Gordo is a large part of the glue which holds CHROMUS together as a group. Gordo played with Phil in a great horn band (West Side of Chicago) performing on trombone & percussion as well as vocals. Gordo plays piano as well, and has an excellent ear for a part being 'musically correct' &/or 'in tune'. He served as assistant engineer/producer to Phil, not only in the tracking & recording of the album, but in the mixing & mastering as well. Gordo also helps out scheduling studio performances, keeping master logs, tracksheets & diaries, and just about anything else that is needed around the studio. 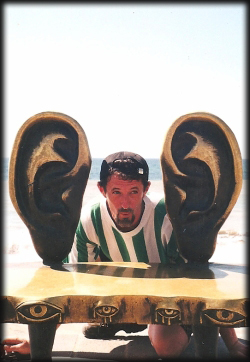 Oh, and last but certainly not least: Gordo Has Great Ears! Get the new album from Amazon now! Site created and maintained by J.C. Davis.